Make your skin soft, smooth and glowing with Natural Vita Rich Face Wash! Enriched with Vitamins C, B3 & B5, this face wash gently cleanses the skin and leaves it thoroughly clean and moisturised. 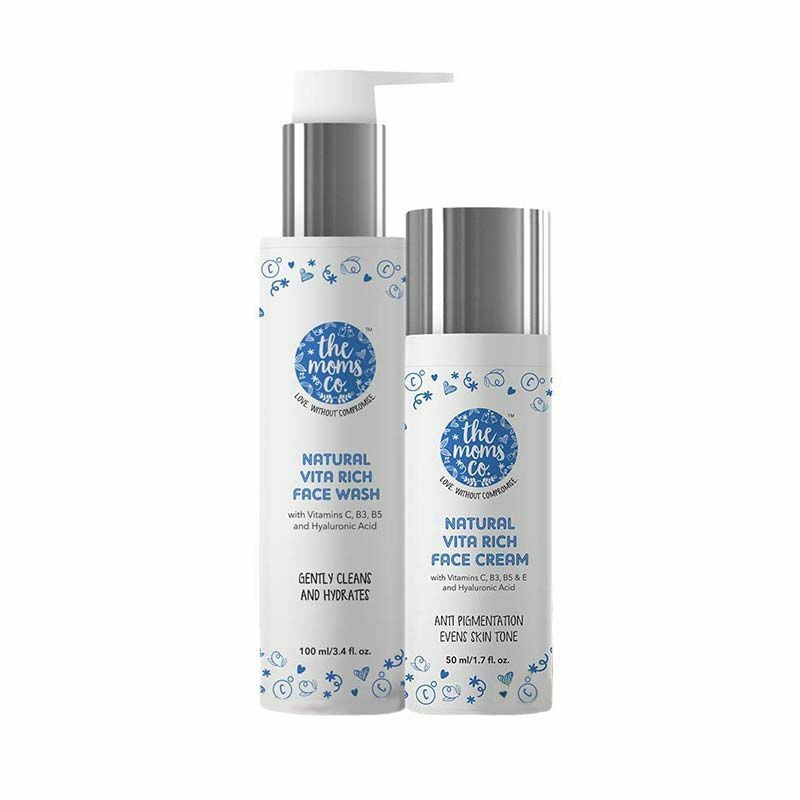 Made using the best natural ingredients such as sulphate free olive oil cleansers, neem face wash extract and hydrolyzed oat protein, this natural face wash is rich in vitamins B3, B5 and E. Follow this up with The Moms Co. Natural Vita Rich Face Cream to reduce pigmentation, blemishes, fine lines and uneven skin tone. This wash rich with gentle cleansers and astringents is suitable for all skin types. About the Brand: The Moms Co is on a mission to help mothers make safe, natural and effective choices for themselves and their families. All The Moms Co. products are developed and tested with the help of the best experts across India, Australia and Switzerland. The Moms Co. lives by its 'nature in-toxin out' philosophy by sticking to only the most effective natural ingredients for its products. All its products are clinically tested, Australian certified toxin-free, made safe and Australia allergen certified so you know you are always getting the safest, natural best for yourself and your baby. Now flawless radiant skin is no more a distant dream! The Moms Co. Natural Vita Rich Face Cream reduces pigmentation, blemishes, fine line and uneven skin tone using the best natural ingredients. Formulated using kakadu plum, chia seed and hyaluronic acid, this natural face cream is rich in vitamins C, B3, B5 & E. It replenishes skin's moisture and gives a smoother radiant looking skin. A water-based moisturiser, it is light on skin even when it hydrates deeply. Use daily for best results. Explore the entire range of Face & Body Care available on Nykaa. Shop more The Moms Co. products here.You can browse through the complete world of The Moms Co. Face & Body Care .